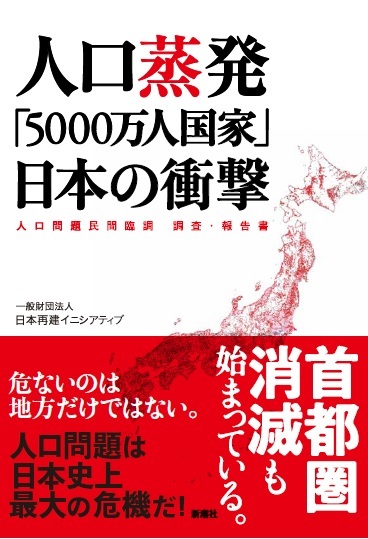 Rebuild Japan Initiative Foundation (Chairman: Yoichi Funabashi) is pleased to announce the publication of Japan’s Population Implosion: The 50 Million Shock (English title is tentative), a book based on the discussions at the Private Ad Hoc Commission on Population Issue. Should the current birth rate remain unchanged, Japan’s population, which stood at nearly 50 million people 100 years ago, will shrink once again to 50 million by the end of this century. And it will not be a country overflowing with the young as in the Meiji Era (1868-1912), but an old country where the elderly account for 40 per cent of that 50 million. If this happens, there is strong fear that Japan’s social vitality and the vital forces of the state will be debilitated, the politics of jealousy become rampant, and people lose confidence and become trapped in pessimism, living just for the moment. No longer will we be able to maintain the culture and traditions we have nurtured unbroken. This must not happen. It must not be allowed to happen. Examine how demographic trends are affecting the various aspects of Japan’s social structure in the context of the Greater Tokyo, life infrastructure, and public finance and the economy, and present the seriousness of the population issue. Study the failures of past policies from the perspectives of population, national land, and politics. Recommend an effective population policy based on the study of the failures. The population policy referred to here alludes to both “mitigation” measures for staging a recovery in the depopulation process as well as “adaptation” measures for maintaining and improving living standards in the process. A factor we have not fully been aware of is the speed of future population decline and the huge scale of “negative chain reactions” that accompany it. The foreword sheds light on the intricately interlinked issue of population decline by examining the risks inherent in the four negative chain reactions that are triggered by a declining population, as well as the conflict of values that the population issue will bring. Depopulation is also affecting Greater Tokyo, quietly but decisively. Loss of dynamism is already beginning to be seen on a full-fledged basis, starting with the outer areas, such as Choshi City, Chiba Prefecture and Yokosuka City, Kanagawa Prefecture. Even in the areas commutable to central Tokyo, there has been a noticeable increase in towns deprived of vitality, especially in new towns. How will population decline change the situation of regional areas? Based on detailed data, this chapter studies how depopulation will make it difficult to maintain life infrastructure that are essential for people to live. The greatest challenge facing the Japanese economy is carrying out fiscal reconstruction as the population decreases. Unless labour productivity is raised, and unless Japan engages in fiscal and public finance and social security reforms, the situation could turn out for the worst, namely, government bond prices could plummet. Why was the population issue neglected? Various factors underlie this, including remorse over Japan’s pre-war militarism when the state made “Beget and Multiply” a compulsory program, memory of the post-war overpopulation and food shortage, and the government not realizing the gravity of the changes in population. From the 1960s, large-scale regional development policies were promoted to solve the unbalanced use of national land, with the population concentrated in the three major city areas of Tokyo, Osaka, and Nagoya. However, these policies did not deliver the expected outcomes. Against this backdrop, from the late 1980s, population and businesses began to be over-concentrated only in Tokyo. The elderly, now making up a majority of the population, exploit young people and future generations. This is the so-called problem of silver democracy. Can democracy fully function in the face of population decline? This chapter considers what is needed to avoid intergenerational confrontations. Japan’s public finances and economy are heading towards contraction due to depopulation, declining birth rate, and aging population. Unless something is done, Japan will fall into a long-term stagnation. The keys to preventing such a situation are the execution of bold measures to counter the falling birth rate and the employment of foreign workers. Businesses that generate attractive employment in regional areas attract people and mitigate the speed of population decline. Companies that sustain their businesses in close collaboration with the regions generate vitality to regional economies that struggle with depopulation. This chapter introduces some success cases from different regions of Japan. This section outlines a new population policy and the approach for realizing this policy.